Home / Major League Soccer / A Heavyweight Rematch? The soon-to-be scheduled MLS Cup rematch between the Revolution and Galaxy could get a whole lot more interesting if the schedule makers decide to smile upon the local XI. On Saturday, ESPNFC.com reported that Liverpool legend Steven Gerrard, who previously hinted his desire to play in MLS in 2015, will be joining the Galaxy following the conclusion of the current EPL season. So what does this mean for the Revolution? Though the league hasn’t yet released the full regular season schedule, what is known is that the Revolution will be hosting the Galaxy at Gillette Stadium. Whether Gerrard will face the locals on the field is another question. The longtime Liverpool midfielder isn’t eligible to join the Galaxy until the MLS summer transfer window opens in July, according to FIFA regulations. Gerrard would occupy the club’s third Designated Player spot, with Robbie Keane and Omar Gonzalez filling the first two. 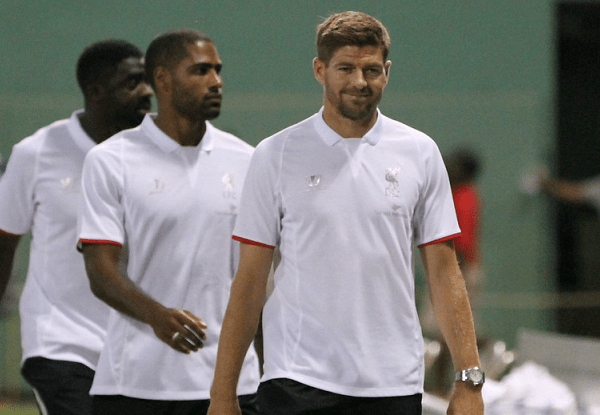 Should Gerrard be available for a selection, it would mark the first time he’d play in the Boston area. During the previous two occasions in which Liverpool has played at Fenway Park, Gerrard did not suit up. Similar to the attendance boost that the Revolution received when David Beckham made his first appearance in Foxborough, Gerrard is expected to be a big draw in New England given the strong turnouts at Fenway Park that Liverpool attracted in friendlies against Roma in 2012 and 2014. Whether Gerrard is willing to play on Gillette Stadium’s artificial surface is unclear at this point. Previous EPL imports such as Thierry Henry have avoided playing on plastic pitches in MLS. The league is expected to release the full regular season schedule on Wednesday. ← Previous Story Ralston Resigns from HOU Post; SJ Next Destination?